Below are some typical questions we get asked commonly by our customers. If you have a specific question that is not listed below, feel free to ask us on our Contact Us page. Which Federal Regulatory guidelines govern Used Oil? The Federal Government through 40 CFR Part 279 - Used Oil Management Standards, regulates used Oil. Most States have adopted similar rules. Be sure to check with your State and Local Governments as well to be sure all the requirements particular to your business or situation are being met. Is Used Oil a Hazardous Waste? In almost all states other than California, Used Oil is a “regulated” material, but is not “Hazardous” by definition. Be sure to research your State and Local regulatory guidelines to be certain. Does my Used Oil have value? From a monetary standpoint, each situation is different depending upon such factors as market conditions, volume, frequency, quality, proximity, number of locations, etc. As such, each customer we work with is evaluated on a case-by-case basis as to whether there is value or not. Does Noble Oil sell new oil? Does Noble Oil provide Parts Washer Service? Yes we do. We provide and promote Aqueous Parts Washers and are a Distributor for the full line of top load and cabinet load CUDA Parts Washers. Visit our Parts Washer Service page to find out more. Can parts washers be rented? Yes. Noble’s full line of Aqueous Parts Washers is available through Noble’s Parts Washer Rental Program. Our customers love this program. Visit our Parts Washer Service page to find out more. Is there a minimum amount of Used Oil or other materials required to work with Noble Oil Services? 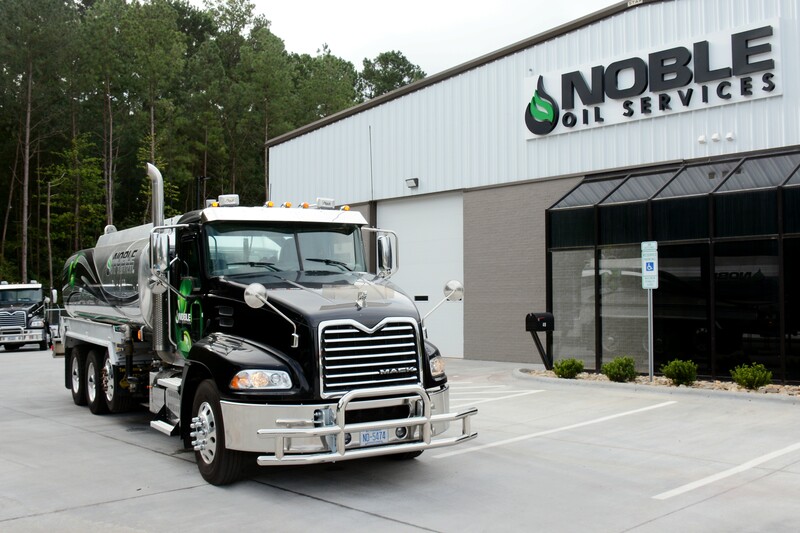 Noble Oil Services is a commercial service provider using large trucks to facilitate its operation. In most instances anything less than one (1) U.S. Drum (55 Gallons) should be taken to your local DIY (Do It Yourself) Recycling Center. If you’re not sure or would like a recommendation for an address to the nearest DIY location(s), please contact us. Does Noble Oil Services accept “Cooking” and other “Vegetable” based Used Oils? At this time, Noble Oil Services only accepts used motor oils. What should I make sure DOES NOT get mixed with Used Oil? Solvents - “Chlorinated” solvents (even at small quantities) will turn Used Oil into Hazardous Waste. Be sure to supply your shop or facility with only “non-chlorinated” sprays, cleaners, etc. to be safe. A certain small amount of water and other materials tend to get mixed with Used Oil. Naturally, however to avoid additional fees for the handling/disposal of your materials, you should always keep your waste/recyclable materials segregated in appropriately LABELED & APPROVED containers. Does Noble Oil Services collect used oil filters? Yes. Noble’s filter service promotes state of the art filter bins and totes versus the 55 gallon drum approach. This improves the look of our customers’ properties and help keeps unsightly filter drums out of sight. Visit the Oil Filter Recycling page to find out more. Can I bring my Used Oil and other Recyclables to you? In some instances yes. However, it’s a good idea to call Noble Oil Services facility to double check. If not, they should be able to direct you to an appropriate Recycling Facility to meet your particular needs. If I change my oil myself, where can I take my used oil to ensure it's recycled properly? For information on where you can deliver your used oil you can go to several websites. Many cities have their own collection programs. In addition you can go to www.earth911.com to find locations in your area. What is Noble Oil Services' Toll-Free service number? NOTE: ALL RESPONSES TO FREQUENTLY ASKED QUESTIONS ARE SUBJECT TO CHANGE AT ANY TIME WITHOUT NOTICE.